During a point in time when record-low mortgage rates should be coercing new home buyers into the market, many potential first-time buyers are seemingly not able to afford what is on the market. As labor costs and demand grow, and as a construction labor shortage continues, builders tend toward building more expensive homes, creating a tight supply of entry-level homes. Not all situations match this scenario, but it is certainly an interesting time in the residential real estate marketplace. Most market trends have been steadily the same for the bulk of 2016, and there’s not much reason to expect a change as we enter the last several months of the year. We have witnessed an overall drop in the number of days a home is on the market before sale, that sale price is generally higher than it used to be and there are fewer homes for sale. The one area of interest that we will be watching will be total sales being made. 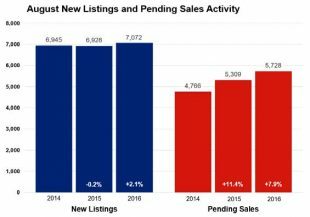 As the drop in inventory continues, it stands to reason that there will be fewer sales, but that has yet to consistently be the case. If residential real estate were a wager to close out the summer golf season, prospective buyers would still be waiting impatiently for prospective sellers to take the putt on the final hole. Yet inventory continues to shrink, as summer vacations end and kids return to school. If the taken putt were to somehow land in the cup and increase inventory, a legendary celebration would occur that might even make a golf course gopher dance.